Gathering and analyzing data about how shareholders purchase and use mutual funds are critical to ICI’s work to facilitate sound, well-informed public policies affecting funds, their investors, and the retirement markets. One avenue that ICI uses to gather these data is our annual survey of US households, which enables us to find how many of them own mutual funds and to gather information on their demographic and financial characteristics. The latest survey was conducted from May through July 2016, and results were first published in October 2016. The survey found that in mid-2016, 54.9 million US households (or 43.6 percent) owned mutual funds and 94.0 million individual investors owned mutual funds. A second publication in October 2016 highlighted some key demographic and financial characteristics of US households owning mutual funds, revealing, for example, that mutual fund–owning households hail from all age groups, incomes, and educational backgrounds. ICI recently published additional detail from the survey in “Profile of Mutual Fund Shareholders, 2016,” which explores in depth how mutual fund–owning households’ demographic and financial characteristics, pattern of mutual fund ownership, financial assets, financial goals, and willingness to take financial risk vary by a number of dimensions. Whether starting to save in a 401(k) plan at their first job, saving to pay for education, or managing income and assets in retirement, Americans invest in mutual funds because they are an accessible, professionally managed, cost-effective tool for meeting personalized savings goals. In fact, the vast majority of mutual fund–owning households (84 percent) agree that mutual funds can help them reach their financial goals. There are more than 8,000 mutual funds available, ranging from domestic or world equity funds (actively managed or indexed), to domestic or world bond funds, to alternative funds, to money market funds, to diversified funds such as balanced or hybrid funds, including target date funds. This breadth and depth of choices enables investors to build personally tailored portfolios. Mutual fund–owning households access funds through a wide array of channels—some work with full-service brokers and independent financial advisers, some participate in retirement plans at work, and some buy funds directly through discount brokerages or mutual fund companies. With the growth of 401(k) plans since the early 1990s, employer-sponsored retirement plans have become the most common channel through which households own mutual funds. In mid-2016, 81 percent of mutual fund–owning households held funds through these plans, while 63 percent held mutual funds purchased outside employer-sponsored retirement plans. *Employer-sponsored retirement plans include DC plans (such as 401(k), 403(b), or 457 plans) and employer-sponsored IRAs (SEP IRAs, SAR-SEP IRAs, and SIMPLE IRAs). Half of households owning mutual funds purchased their shares through investment professionals (including full-service brokers, independent financial planners, bank or savings institution representatives, insurance agents, and accountants). About one-third purchased their shares through the direct market (including mutual fund companies and discount brokers). Younger households are more likely to own mutual funds only inside employer-sponsored retirement plans, such as 401(k) plans. Indeed, in mid-2016, 45 percent of households younger than 35 owned funds only inside employer-sponsored retirement plans, compared with 24 percent of households aged 65 or older. Older households were more likely to own mutual funds only outside employer-sponsored retirement plans, in part reflecting higher rates of individual retirement account (IRA) ownership among that group. In mid-2016, 39 percent of households aged 65 or older owned mutual funds only outside employer-sponsored retirement plans, compared with fewer than 20 percent of younger households. Ownership of mutual funds both inside and outside employer-sponsored retirement plans was highest among households in their peak earnings and savings years (48 percent among households aged 35 to 64). This pattern of mutual fund ownership is consistent with these households’ stated goals for their mutual fund investments. Households in their prime earnings and savings years were more likely to indicate retirement as their primary financial goal for their mutual fund investments (81 percent of mutual fund–owning households aged 35 to 64). Though a majority of the youngest households (68 percent of those younger than 35) also said they were focused on retirement, 10 percent said they were primarily focused on saving for a house or other large item. The oldest households also cited a focus other than retirement: 20 percent of households aged 65 or older said they focused on current income as their primary financial goal, while 14 percent said that saving for an emergency was their financial priority. This wealth of US household information enables us to create a portrait of the “typical” mutual–fund owning head of household. 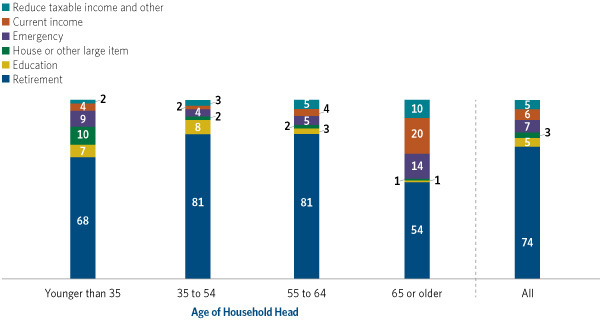 You can read about this at the full report and view 90 charts and tables on shareholders’ characteristics by age, employment status, household income, risk tolerance, and more. You may also find more information in our website’s investor research section.